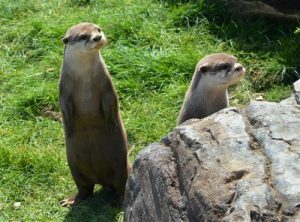 Portaferry, To celebrate World Otter day, Spring Bank Holiday and Ards and North Down Puppet festival we our combining the three events into one big Otter Mayhem 2-day Event, taking place on Sunday 28th and Monday 29th May. The fun begins at the Front of House where you’ll be given your welcome pack full of all the fishy goings on what’s happening that day, it will also include a Quiz like no “Otter” so pens and pencils at the ready. As you begin your journey you’ll swim through our Viking Shores to the Tropical Beaches, flowing into our pirate’s cave for an underwater viewing experience on your exciting aquatic learning experience where you will meet our fin-tastic Exploris entertainer who will be roaming around the Aquarium. On Sunday 29th Little Gem Puppets Production of the Three Little Pigs will be showing at 12pm and 2pm. An interactive, fun show that engages all audiences – You otter not miss it!! Travel through to the outdoor seal sanctuary, where you’ll learn about our successful seal rehabilitation program. Float on down to meet our stars of the event; our Small-Clawed Asian otter family where you’ll learn lots of interesting Otter facts (Otter quiz tip) Check-in to our social Media accounts for a 360 view and live stream of inside our otter holt. Otter feeding times are not to be missed! Drifting upstairs to get up close and personal with our reptilian friends. Our constrictor pals will be out on display during set times throughout the day. Get as close as you can get without getting wet with our native animals during our open pool demonstration throughout the day. Throughout the day get messy in our Crabby Crafts Club with themed Otter puppet arts and crafts and make the day memorable with our mer-mazing face painter. Fish-ally relax after a fun filled day and enjoy the amazing food and beverages in the Craken Café. It will be an event like no Otter! Exploris, Northern Ireland’s only Aquarium and seal sanctuary re-opened in August 2016 and to date we have welcomed an amazing 100,000+ visitors from home and abroad but we are continuing to develop and enhance our visitor experience with the opening of our new soft play area to an extensive Craken Café menu, for breakfast, lunch, coffees and treats with lots of goodies for the kids to eat!